Did you miss the presentation for incoming 7th- and 8th-graders? Do you have questions about scheduling for next year? Click here to see the presentation information. If you are picking up your student out front after school, please be sure to pull over to the curb. Some students have been running into the middle area and jumping in the car as the driver barely stops. We've had several close calls, so we all need to be extremely careful out there. Thank you for your cooperation! 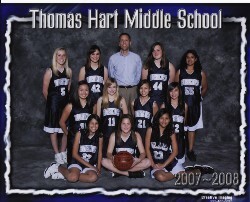 Hart's 8th-grade girls basketball team had an impressive season, taking third place in the Tri-Valley Athletic League. 7th-Grade Girls Basketball Team is No. 1! Hart's 7th-grade girls basketball team swept the league championship during last week's playoffs. PUSD is required to notify parents and guardians of students annually as to the types of pesticides that may be used as the school. Please read the attached letter for more information.